Marilu Morency is a Southern California artisan, with an educational and professional background in textile design. 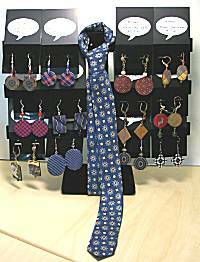 She is known for her beadwork...but introduces her new earrings line Honey...Have You Seen My Tie? as she melds more of her background. Inspired by the recycling trend, Marilu repurposes discarded men's ties, taking interesting parts of the fabric and applying them to shell, buttons or stones as backgrounds. Cool! Tie fabric bits, transformed into earrings rich with textile pattern! A bit of men's tie fabric in a super dark navy with silvery white in snowflake pattern. The fabric is mounted to a flat black disk, dangling below surgical french earwires. 1-3/4 inches long overall, 3/4 inch across, ultra lightweight. A bit of men's tie fabric in a navy and denim blue wavy stripe. The fabric is mounted to a flat gray mother-of-pearl disk, dangling below surgical french earwires. 2 inches long overall, 1 inch across. A bit of men's tie fabric in a lakeside artwork scene, the left and right are different pieces of the art in colors of blue, yellow, gray and white. The fabric is mounted to a flat gray mother-of-pearl disk, dangling below brass leverback eurowires, yellow bead accent. 2-1/8 inches long overall, 11/16 inch across, lightweight. A bit of men's tie fabric in a classic plaid check pattern in mustard and blue colors that shift a bit as different thread colors join. The fabric is mounted to a flat tigers eye color disk, dangling below copper plated leverback eurowires, yellow bead accent below. 1-1/2 inches long overall, 9/16 inch across, lightweight. Reviews for Honey Have You Seen My Tie? Read about what others think of Honey Have You Seen My Tie? jewelry! Instead of reviews for a specific product, this is a place to share about the designer line in general.